Having grown up primarily watching US high school movies (many excellent may I add! 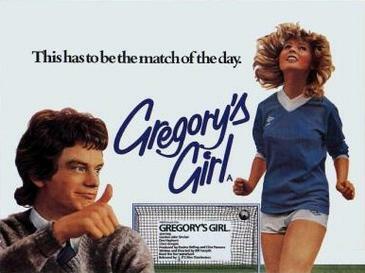 ), returning to ‘Gregory’s Girl’ feels like a breath of fresh air. This little Scottish film was doing things 35 years ago that would be praised as subversive or original these days if it came out of the US, and it still holds up well to this day. The film follows (John Gordon Sinclair), an awkward teenager from Cumbernauld in Scotland over the space of a few days as he grows up, falls in love (or thinks so) and meanders through life. To this day, I don’t think there’s been many films that have so successfully captured the irreverence of youth. Part of what I really like about this film is how well director Bill Forsyth creates the world and its characters. Whilst Gregory is our focal point, we get a feel for the school as a whole, both in terms of other pupils and the teachers and it brings a very real appeal to proceedings. Everyone can remember times in their youth when they’d ‘fall in love’ with someone – occasions that we’d be likely to look back on these days and laugh. That’s what happens to Gregory with Dorothy (Dee Hepburn), the attractive new player in the football team, and a lot of the film’s success is in how well it captures it, but also in how the script develops to build on this lust. The script is smart and witty and it superbly captures that moment in time when you’re caught between childhood and adulthood, and the thoughts and feelings that come with it. It also surrounds Gregory with quirky characters such as his friend Andy, who is an excellent comic foil and has a minor subplot of his own (not to mention that famous penguin of course!). Forsyth’s best film was yet to come (‘Local Hero’), but where that film is very grown up in its themes, ‘Gregory’s Girl’ is the perfect film about growing up and the honest and charming approach to the material still feels refreshing many years later. Another notable aspect of the film is the lack of ‘stock’ characters that you’d find in high school films in general and this allows the film to focus on the jovial and funny banter between the characters as opposed to engineered feuds or dramas. I especially love the way the film ends, going against what you would expect to craft a funny, sweet ending that makes perfect sense when you think about it. ‘Gregory’s Girl’ remains one of the great high school movies, and it’s certainly one of the finest films to come out of Scotland. Well worth returning to.